Biologists have already lifted 157 tons of oil from the bottom of Lake Shchuchye, which was polluted by the Usinsky accident in 1994. New technology developed by Siberian scientists can clean lakes polluted by oil spills, even in winter when temperatures fall as low as -50°C. This method has already given a new lease on life to Lake Shchuchye, which suffered a catastrophic oil pipeline accident in 1994. Bodies of water ravaged by oil pipeline accidents are a common problem in oil-producing regions throughout the world. The current most popular water treatment techniques are dredging and microbiological agents. Both are expensive and labor intensive, however. Researchers at Tomsk State University (TSU) have pioneered a new and inexpensive technology that lifts oil from the bottom of a body of water, pushing it to the water's surface in any season. Biologists have already lifted 157 tons of oil from the bottom of Lake Shchuchye, which was polluted by the Usinsky accident in 1994 when a decrepit pipeline spilled more than 100,000 tons of oil. This disaster was listed by the Guinness Book of Records as the worst environmental disaster of its kind. "Attempts at a clean up were made a few years after the accident, but it was not possible to return the ecosystem to its original state," biologist Daniil Vorobyov told RBTH. "The vast majority of fish had severe congenital abnormalities." The new method is based on the laws of physics and does not require the use of chemicals. A heavy hose is lowered to the bottom of a lake, and an air stream is pumped to an oil pocket. As a result, air bubbles push oil to the surface, where the liquid is collected in floating pools filled with absorbents. This technique is best suited for lakes with rocky, clay or sandy bottoms, and it reduces the concentration of harmful substances in the water to below dangerous levels. Scientists say, however, that the method allows cleaning not only the bottom but also the entire lake. There are no limitations on water depth or time passed since an accident. "Some accidents are not immediately known," said Vorobyov. "Oil sinks to the bottom of a body of water, killing many life forms and causing deformities in fish. We created a technique that significantly reduces the consequences of oil pollution in virtually all bodies of water." Until now, there were no technologies to remove oil from frozen lakes at a low cost. Siberian biologists, however, found a solution. Channels that converge near oil collecting wells are made in the lake's ice covering. As with the "summer" technology, hoses are lowered through a hole to the bottom and then air is pumped in. In the frozen lake, however, the oil lifted from the bottom goes to a collector via these channels. A mobile hangar is installed over the collector where heaters create a favorable working temperature and the oil is removed. Ice-covered lakes can be cleaned of oil at any air temperature, even at -50°C. According to biologists, it is better to clean lakes in winter when ecosystem processes are slowed down or suspended. "Fish reproduction takes place in the spring and summer, so it is preferable to clean in the cold season," Vorobyov said. 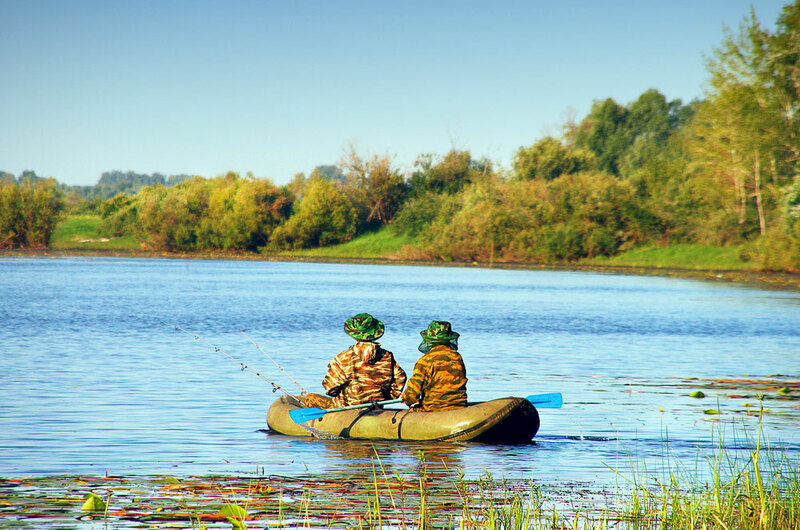 In the case of Lake Shchuchye, the water purification experiment was a huge success, and the number of abnormalities in fish decreased by 98 percent. Life returned to the lake, and today mollusks, crustaceans and other organisms call it home.